Tootoomoo > Blog > Posts > Community > Sushi Classes with Alice at Tootoomoo! Looking for the perfect kids party, hen night, corporate bookings, or adult private event? Join us at Toomoomoo Crouch End for sushi classes with Alice! Adults will be welcomed with the choice of a deliciously perfect Tootoomoo cocktail or mocktail. The class will then follow with the making of a Temari sushi ball – yellow tail or salmon (nigiri style slice) with wasabi & sesame seeds – tied with a chive, topped with either fish tobiko eggs or a small slice of lemon. Following that will be a scrumptious creation of Gunkan/’battleship’ sushi – tobiko eggs, very small slices of cucumber layered together and yuzu mayonnaise. The class will then learn to make a Tootoomoo favourite, Kappa maki & roasted sesame seeds. From there, you will learn how to make Temaki (hand roll) – avocado and ‘seasonal veg’ (from the Tootoomoo menu). The class will finish off with tasty Futomaki with raw vegetables, wasabi OR teriyaki salmon. We can’t forget about the little sushi chefs! Kids can join in on the fun with their own class! Perfect for a private event. They will be greeted with a deliciously tasty Tootoomoo mocktail. Alice will then teach them how to make a Avocado temari (small sushi ball) to be decorated with nori using nori punchers. They will learn the popular Kappa maki with roasted sesame seeds and Rainbow Futomaki – ‘seasonal veg’ (from the Tootoomoo menu), with lots of colourful vegetables and delicious Yuzu mayo. 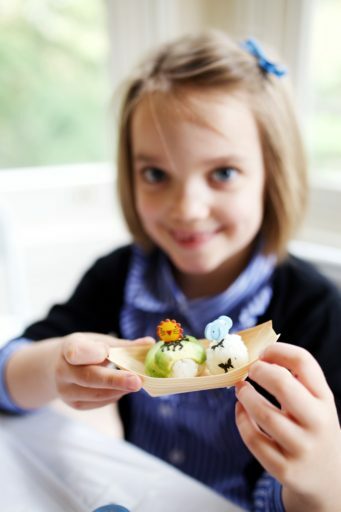 They then get a chance to decorate a bento pick with edamame beans. 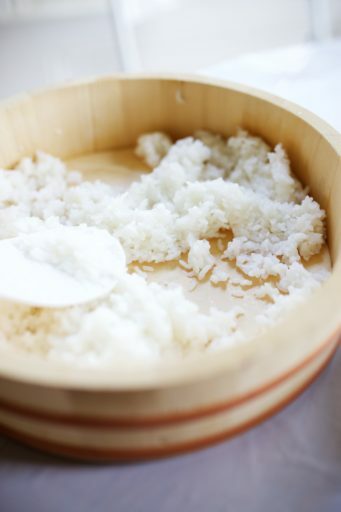 Several small dishes will be provided for children to enjoy after the sushi classes. For an additional cost, children can enjoy frozen yoghurt and or small tapas dishes. 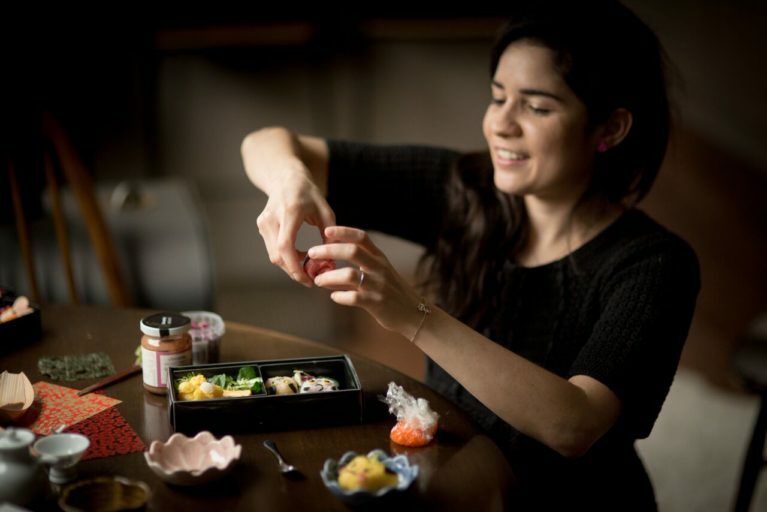 Alice Sushi Art hosts sushi, bento and origami making workshops, private events and parties across London for adults and children. Alice spent 2 years in Japan and developed an interest in Japanese food and culture, especially sushi and origami! She designs origami art and home décor pieces to purchase online via Etsy. Alice has over six years’ experience of working with children of all ages and offers unique birthday parties, children’s events and workshops. We draw on popular trends and our customer’s requests to keep our workshops up to date, whether a child’s favourite character, theme or seasonal inspiration. The focus of our sushi classes is on creativity, experimentation and having fun! Reach out to us at crouchend@tootoomoo.com to book your spot! Perfect for your next kids party, hen night, corporate booking or adult private event. Groups of up to 15 can book for a private event.